Black or white paper can indicate mourning. If you know the basics of origami, Japanese funeral paper dolls should be an easy project for you. Although dolls are not customarily part of Japanese funerals, there are several color and construction choices that can make the doll appropriate for a Japanese memorial service. The art of origami and the practice of doll making are intricately linked in Japanese culture. In fact, some experts believe that the first origami creations may have been part of a purification ritual imported from China. In this ritual, which occurred on the third day of the third month, people symbolically transferred their illnesses and impurities to large paper dolls by rubbing the dolls against their bodies. They would then dispose of the dolls by throwing them into a body of water. Many historians feel that this ritual was the basis for the Hina Matsuri Festival, or Dolls' Festival, a Japanese holiday that occurs on March 3. As part of the celebration, little girls display origami dolls. These dolls, often called "anesma ningyo," or "elder sisters," usually wear elaborate traditional clothing associated with the upper classes in ancient Japan. Generally, there is an emperor and an empress as part of the set, and these sometimes symbolize the little girl's future marriage. The dolls are for display only and are brought out as part of the festival each year. Often, the same paper dolls will be passed down from generation to generation. 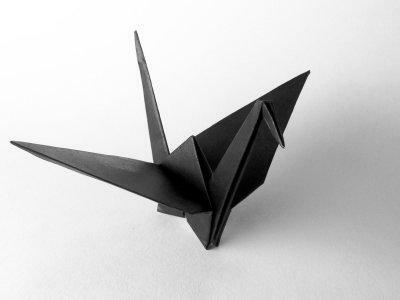 While origami dolls are not used in traditional Japanese funerals, it's possible to modify the design to indicate that the doll is in mourning. These modifications can make the doll very meaningful to family members who have lost a loved one. Because paper dolls are a fairly simple project, they make an excellent choice if you're just learning the art of paper folding. Begin by selecting your paper. In Japan, the color white is sometimes associated with mourning; however, people often wear black to funerals. Either of these colors could make a good choice for a funeral doll, and black and white patterned paper could also be meaningful. Avoid bright colors. Hold the paper at an angle, and fold the bottom corner up to meet the top corner. You should now have a triangle shape. Crease the fold to mark it. Unfold the triangle, and fold the top left side down so it is even with the center line created in the last step. Repeat with the bottom left side. Your structure should now resemble a kite. Flip the entire shape over, and once again, fold the short sides in to meet at the center line. Your shape will still look like a kite. Orient the structure so that longer pointy end of the kite is facing toward you. Bring the bottom point up so that it almost meets the top point, and crease the fold. Bring the point down so that it is even with the bottom of the shape. Turn the shape over. It will now resemble a trapezoid with a small triangle at the top. Fold the tip of the triangle down. This will create the doll's head. Now fold the right side of the trapezoid in to form a sleeve. Repeat with the left side, slightly overlapping the other sleeve. Folding the right side in first indicates that the doll is wearing funeral clothing. Use paint or markers to create the doll's face. You may want to create a design that shows emotions like grief or peace. In Japan, it is customary to give a gift of money when you attend a funeral. Generally, the money is placed in beautifully patterned envelopes, which strictly adhere to the black and while color scheme. While these envelopes don't usually feature origami, Japanese funeral paper dolls might make a touching embellishment.